In April 2013, the Africa Research in Sustainable Intensification for the Next Generation (Africa RISING) and Nile Basin Development Challenge (NBDC) jointly organised a ‘Training of Trainers’ workshop in the use of SLATE: A tool for Sustainable Livelihoods Asset Evaluation. The initial workshop was held in Addis Ababa. 30 participants from the Africa RISING’s four project sites and NBDC Innovation platforms attended the training. 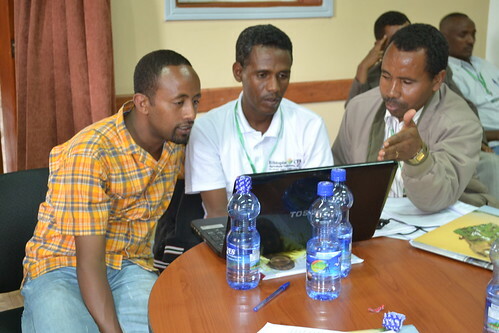 The training combined both conceptual and practical sessions in Jeldu woreda, one of the NBDC research sites. SLATE has been developed by ILRI (International Livestock Research Institute) Scientist Peter Thorne. The SLATE tool uses the Sustainable Livelihoods approach of the United Kingdom’s Department for International Development (DFID) to think about scope, priorities and objectives for development. The tool helps identify the range of assets and options open to households and get a clearer idea of the constraints and opportunities available to them. By concentrating on the range of different assets that are accessible to farm households, it ensures that these can be taken into account when designing development interventions. How does SLATE complement NBDC innovation platform activities? There is a recognized need to tailor soil and water conservation (SWC) interventions to specific socio-economic and biophysical conditions. The NBDC pilot interventions aim to improve collaboration between stakeholders at woreda level in order to ensure that SWC activities are better tailored to local contexts. Although farmers participating in the first year pilot interventions expressed an interest in fodder development, there had been limited consideration for the needs of different types of farmers. In order to improve the fodder interventions undertaken in 2013, innovation platform members realized they needed to consider variations in livestock holdings, land size and wealth between participating farmers as well as the inclusion of farmers without livestock. NBDC researchers organized the SLATE training to build the capacity of platform members to identify the needs of different farming households. On the First day, Peter Thorne and Amare Haileslassie shared the previous SLATE-based survey processes and findings undertaken at Bekoje, Arsi as well as the various steps around data collection and software demonstration. This was followed by a group exercise to familiarize the participants with the software. For the field work, trainees were divided up in to three Kebeles (Seriti, Kolu Gelan and Chelanko) in Jeldu woreda of the Oromia Region, one of the NBDC Innovation Platform sites. During the first day of the field work, each group had a chance to meet and discuss with selected farmers to identify livelihoods indicators for their specific communities. With the selected farmers each group were able to identify 49-53 livelihoods indicators. On the second and third day individual household interviews were conducted with farmers (50 farmers in each kebele) to assess their asset status based on the already identified livelihoods assets indicators. The data collected from each household were then entered in the SLATE software to generate a set of livelihoods asset pentagons which gave a quick overview of the areas in which households and communities may differ. On the last day of the training, participants presented review of the field exercise which covered the approaches they followed, the challenges and lessons learned, the results of their interviews as well as key issues for future considerations. Read more about the SLATE training on the Africa RISING workspace. The Nile Basin Development Challenge (NBDC) is funded by the CGIAR Challenge Program on Water and Food (CPWF). It aims to improve the resilience of rural livelihoods in the Ethiopian highlands through a landscape approach to rainwater management. Sustaining landscapes: Thirty years’ learning to improve rainwater and land management in the Blue Nile basin of Ethiopia. Is ‘Social Cooperation’ for traditional irrigation, while ‘Technology’ is for motor pump irrigation?